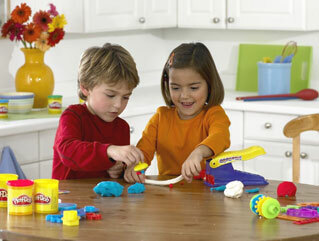 Preschoolers, and other young children, love playdoh. It’s perfect for their tiny hands and imaginative hearts, and it’s safe and non-toxic, which means it’s perfect for parents too. Unfortunately, playdoh has the nasty habit of getting stuck where it shouldn’t. It ingrains itself into carpets under little feet, litters the kitchen table, and, always, always drys out right when your toddler is in melt down mode, and you thought it’d be your saving grace. We here at Sparkle thought we’d do a little research for you, since National Playdoh Day was just the other day, and see what we could find out about this popular product that children love so much. We broke it down into two different scenarios, so no matter how playdoh comes up today, Sparkle has you covered! Scenario: Playdoh all dried out? Tired of watching PAW Patrol for the hundredth time and have an hour you need to fill? No problem — make your own Vegan Play Dough! It’s never too early to teach your child to be sustainable and to make their global footprint a little smaller. Vegan Mamma has a great recipe for Vegan Play Dough, which we’re going to include here. If you’d like to see her blog, and other cool vegan recipes, definitely check her out! We love that you can avoid artificial coloring as well. Making natural choices when your children are young, can really benefit them in the long run. We are their first role models, after all! So, there you have it! Playdoh is such an integral part of childhood, and we hope that these tips alleviate some of the natural stress that comes with raising children. Keep your head up guys — we know that you’re awesome parents, even if it doesn’t always feel that way. We’ll make it through, one day at a time!